ANC RAGE RV5 60c Get Yours Today! 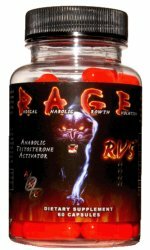 RV5 - the orange capsule and hue on the RAGE name gives the hint of what this product is all about Intense! 3 radical ingredients comprise RV5. 2 methylated and 1 non-methylated make this product a bit much for the novice and warrants extra emphasis on recommended supporting supplements. (I.e. RV1, Liver support, joint, protein and water intake etc.) This is a true bad boy and delivers excellent dry gains while increasing metabolism. Unbelievable strength with significant size is what's in store if you try this beast. This is the SOSTENOL-250 formula. Serious body builders only. Using the high quality, high concentration ingredients, ANC has created the perfect product for gaining muscle mass while cutting away unwanted fat. 2 capsules daily spaced by at least 8 hours. cycle 15 days on, 6 days off, and 15 days on. Use an estrogen blocker and get at least 300 mg of Milk Thistle Extract daily during the entire 5 week cycle. Suggested Use: Take one (1) capsule two times daily. DO NOT exceed recommended dose. Best results when taken with a high protein diet. DO NOT take for more than 30 consecutive days without a 90 day break in between. When taking this product consume 72 oz of water daily. Persons who are subject to performance enhancement testing should consult with their sanctioning body before use. Women who are using birth control, pregnant, or lactating should not use this product. No for use by persons under 18 years of age. Do not use this product if you are at risk for or being treated for prostrate condition, high blood pressure, heart, thyroid or psychiatric disease, depression, seizure disorders, strokes, or other medical condition. Consult your health care profession prior to starting any Prohormone program and if your are taking any medications. Make certain there are no drug interactions.